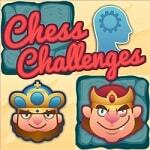 Try to defeat artificial intelligence in the game of chess. Before you open the choice between blue or red teams, as well as the difficulty level from the easiest to the most difficult. The defeated figure will automatically fall into the cage until one of the kings is defeated.